Eating and Exercising to Save My Life: The Role Diet and Exercise Play in Cystic Fibrosis. Diet and exercise. Diet and exercise. The whole world hears this over and over again. Diet and exercise are the key to a healthy life and to preventing and/or managing disease. 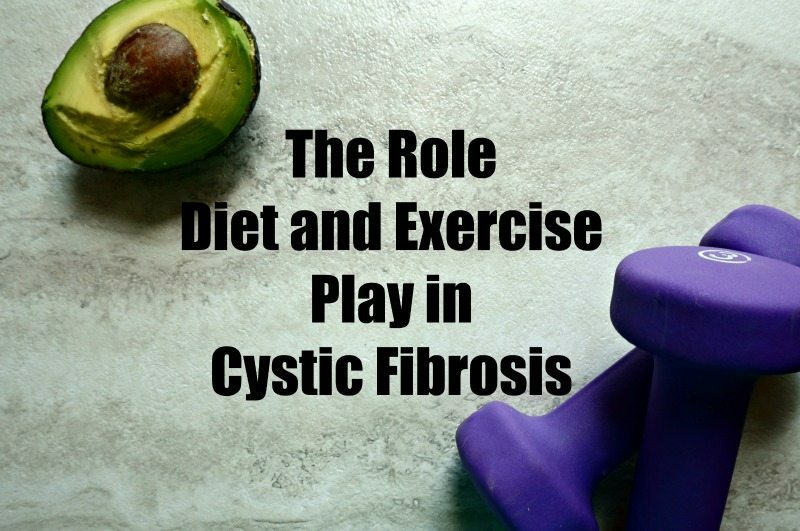 What role do diet and exercise play in managing Cystic Fibrosis? In my opinion, the role is huge. Monumental. Life changing. Life prolonging! For me, what I eat and how I exercise plays such a key role in how I feel and function every day of my life, I refuse to take it lightly. 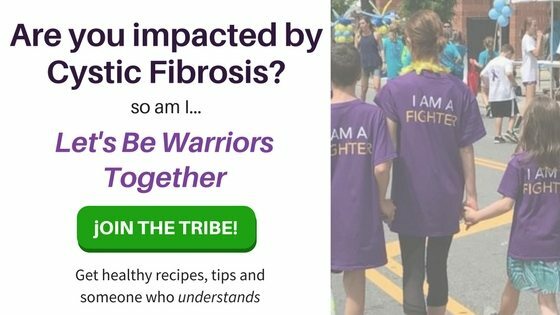 So what do I do to keep myself healthy or at least as healthy as I can be as I battle Cystic Fibrosis? I focus on diet and exercise. Exercising daily is a way to help improve and/or maintain lung function and to help prevent osteoporosis. Pretty important things, don’t you think? 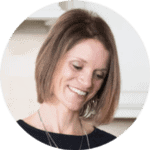 I was diagnosed with Osteoporosis at the ripe old age of 30 (that is what years of undiagnosed malabsorption will do to a body). To help combat further damage to my bones, I do light weight bearing exercises daily. I am so blessed to have healthy lung function, considering my disease. I would like to keep it that way. I have found it helpful to do cardio everyday for at least 20 minutes. At the end of that cardio, I am always able to cough up sputum that has loosened up through my exercise–and getting that thick mucus out is key to keeping my lungs healthy! Cystic Fibrosis Breathing Treatment Tip: Do your hypertonic saline treatment AFTER a workout–this really is key for me to get my sputum out! How do I stay motivated to exercise? Well, breathing and not breaking every bone in my body do it for me!! Actually, I have found a show that I watch everyday while doing my exercise. I have my computer next to me streaming my workout while The Chew is playing on my television. I call this multi-tasking! Plus, it helps me enjoy the workout more. I also find that working out at home is a much better option than treking to a gym–you can read more about why skipping the gym is wise for us cfers here. Bottom Line: Find a routine that works for you that incorporates both cardio and weight bearing exercises to improve both lung function and bone health. You are so lucky that you can eat whatever you want and never gain a pound. Before people know my story, and sadly even once they hear my story, I am judged. Judged by my weight. Judged by what is in my grocery cart. Judged by the fact that I passed up on a piece of cake. People assume that I am skinny by choice. But the fact is that I am so much more than skinny. I am malnourished. I struggle with controlling blood sugar. When I eat processed foods, I end up in the bathroom for days and lose weight, instead of gaining it. Because of pancreatic insufficiency, I have to take anywhere from 4-10 pills every time I eat or drink anything with fat or protein. Even though I am skinny, my stomach is so bloated with undigested food, I look like I am 4 months pregnant. We have considered feeding tubes in the past. I have even been told my weight is so low, it could cause my organs to shut down. So this “skinny thing” not so much of a blessing, huh? I am as much on a diet as any person who is struggling to lose weight. Only my diet is high in calories and fat and I can NOT afford a cheat day. Regardless of how I feel or what my day holds, I must eat. And eat at regularly scheduled intervals to control my blood sugar. So what do I eat to stay healthy? Minimally processed foods/Real foods: My medications will never make up for my body’s natural ability to absorb nutrients. I don’t get to pick and choose what my body will decide to break down and absorb each day. Therefore for me, I focus on a diet full of wholesome, nutritious foods, void of as many preservatives and artificial ingredients as I can manage. And let me tell you, I feel better. I have more energy. I fight off infection easier. My vitamin levels are better. 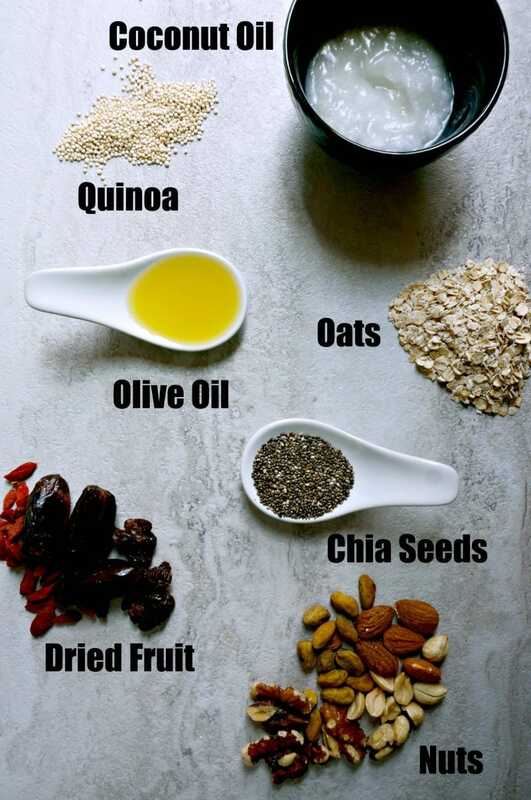 High Fat: Getting extra fat into my diet is easy through sources like avocados, olive oil, nuts, coconut oil, and seeds. I do include full fat dairy as well, but the majority of my fats come from unsaturated, plant based fats. I have found that I am able to absorb these fats better than animal fats–meaning less trips to the bathroom. 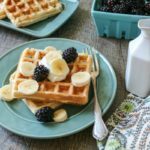 I love recipes like my Peanut Butter Protein Smoothie and Instant Pot Creme Brulee, for a decadent treat that is loaded with healthy fats. High Calorie: Higher fat equals higher calories. However, too much fat has never been a good thing for me. I round out my diet with whole grain carbs, like homemade wheat bread and dressed up baked sweet potatoes, that are packed with a healthy dose of calories. Balance: Life is all about balance right? And while I would like to say that I can eat my cake whenever I want, that is not the case. I need to eat my cake balanced with protein–or my sugar will drop to levels that have caused me to crash to the floor (and since that tends to scare my family, I try not to let that happen!!) I am sure to eat every 2-3 hours and include a healthy fat, healthy carb, and protein each time I eat. I find peanut butter yogurt dip paired with fruit or Apple Pie Larabars are a balanced option. As one of my doctors stated, Just ask for your cake with some jerky! 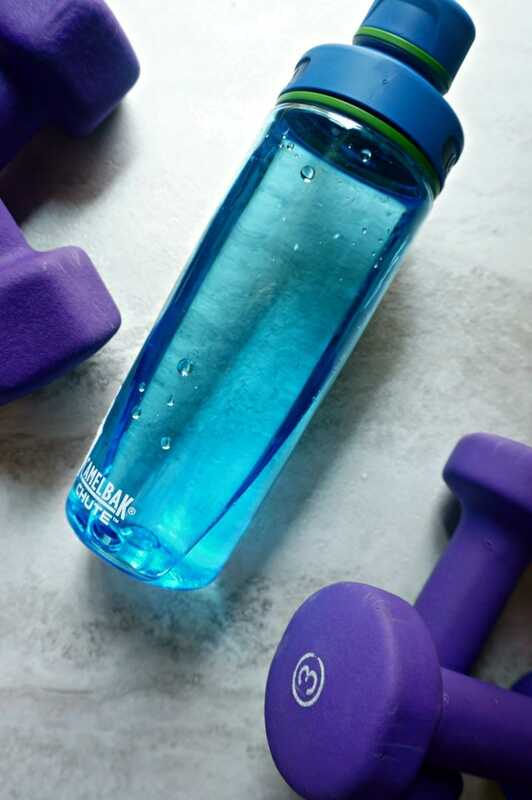 Hydration: Embarrassing truth: I sweat, a lot. I live in the south too, where the days are often hot and humid. To keep myself hydrated, I am never without water. I flavor it with mint or lime or lemon to keep it interesting. I also make my own Electrolyte Water to keep on hand to drink after exercising or when I am having intestinal issues. I don’t consider my diet and exercise restrictive, I consider them a choice I make daily to keep myself healthy. If I stray from my routine, I tend to feel it instantly and can suffer negative results for days, weeks, and sometimes longer. It is just not worth it for me. I want to be a champion, a CF Champion, and for me–diet and exercise are crucial to that equation. Do you want to be a CF Champion as well? Check out Walgreens CF Champions site. What is your battle with diet and exercise? I want to help! I want to know, what kind of recipes/healthy eating tips do you want to see moving forward? Your dedication to taking care of yourself is such a beautiful selfless thing <3 Keep on truckin! I am so proud of you, your dedication and tenacity is so inspiring. Love how you have taken control of your health and see your choices just as part of your life, not a special diet. Thank you for bringing awareness to this. It sounds like you are doing your best to take care of the only body you have. Good for you, girl! You’re an inspiration! Such great ideas for all of us! Thanks for bringing awareness! Diet is so important when it comes to our health. Exercise is too, but diet is definitely #1! It’s amazing how much better anyone can feel when they eat real whole foods! It is a night and day difference for me when I eat healthy! Thank you so much Alyssa! 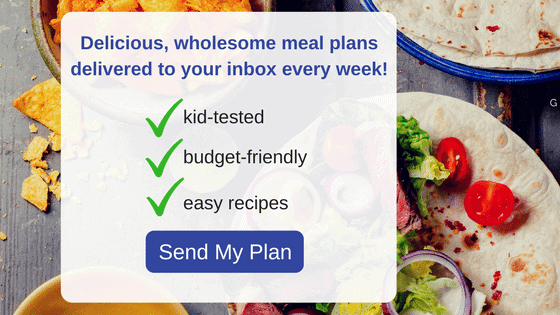 It seems like everyone would benefit from adding the food you listed to their diets! I love nuts and quinoa. Just bought a huge bag of chia seeds for smoothies, been eating them every day! They are such a great source of health!